The Science Fiction Poetry Association maintains two forums (a yahoo list-serv and a FB group page) where members of the SFPA and the broader community discuss topics relevant to the speculative poetry field. The SFPA awards, projects, and publications are items of perennial interest; we often hear suggestions for changes to our rules and procedures, and debate their relative merits. One ongoing debate within the forums (and indeed, in the literary world) is the exact definition of speculative. In its constitution, the SFPA defines itself as an organization dedicated “the genres of science fiction, science, fantasy, horror, speculative, and all other areas of poetry and related thematic interest which current practitioners and readers commonly accept as inclusive within the broadest reasonable limits of the term.” Nevertheless, members of our community consistently disagree on what constitutes “the broadest reasonable limits”. While this may seem like a philosophical or semantic question, it’s also a practical one. Each year the SFPA publishes two award anthologies (the Rhysling Award and the Dwarf Stars) of speculative poetry, bestows the Elgin Award for chapbook and book-length speculative poetry manuscripts, and hosts a speculative poetry contest with cash prizes, with the express purpose of highlighting the very best speculative poetry being written today. 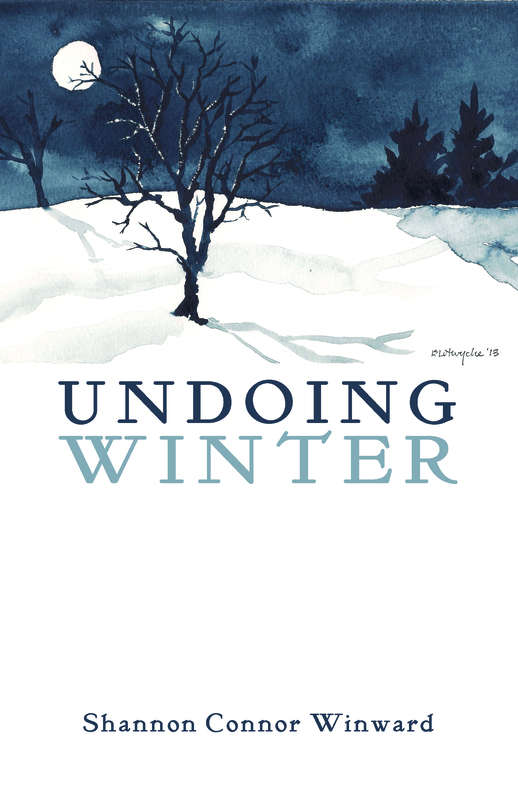 The need for a definition of speculative poetry as it pertains to eligibility for these awards, as well as our quarterly publications—namely Star*Line (the official SFPA newsletter) and Eye to the Telescope (the SFPA online magazine)—is a concern frequently raised by SFPA members, and has at times left the community vulnerable to controversy. In response to these concerns, the SFPA officers published an informal online survey entitled “What Is Speculative Poetry” in November 2016. The main purpose of this survey was to determine whether there is an overall consensus among the membership regarding what genres or sub-genres of poetry belong under the heading “speculative”, assuming no other genre elements are present. Little to no definitions of each suggested genre were provided, by design; the intention was to leave it up to survey participants to decide, based on their own understandings, which categories should be included. As of January 25th, 2017, 89 people participated in this survey. A detailed report of the results appears below, along with select comments from participants. *Correction: “SFF Tropes used only as metaphor appears twice. This is an error. The second appearance (at 37%) should read “Science used only as metaphor”. See below for results table. 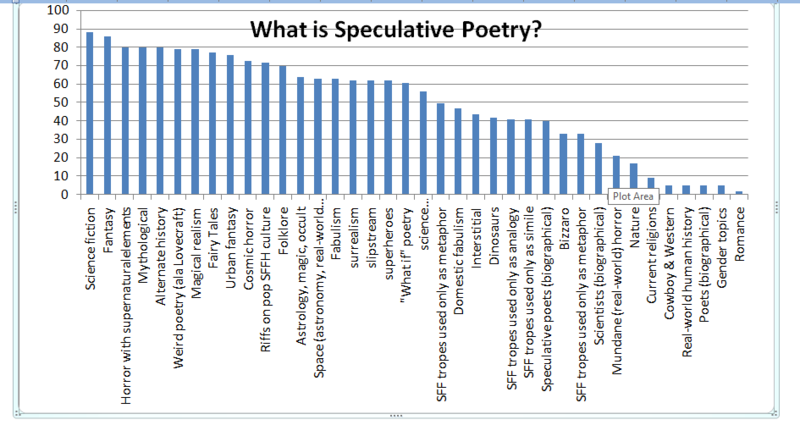 As indicated in the graph and table below, the results of the “What Is Speculative Poetry” survey represent a wide spectrum of opinion regarding what counts as “speculative”. On the upper end of consensus, we find categories that are understood across the literary landscape as falling within the speculative umbrella, including Science Fiction, Space science & exploration, Fantasy, Magic, Supernatural Horror, Myth and Folklore, Fairy Tales, Alternative History, SF&F pop culture, Superheroes, Surrealism, Slipstream, Fabulism, and Weird and “What If”. Genres that fell more towards the middle of the spectrum—that is, those receiving support by 40-65% of responders, included Science (physics, chemistry, biology, etc), Domestic Fabulism, Dinosaurs, “Interstitial” works, biographies of speculative poets, and poems in which traditional SF&F tropes as literary device (analogy, simile). On the lower end of the spectrum—those genres that are most controversial, according to responders—we find Bizzaro, SF&F tropes as metaphor (bit of inconsistency there), biographies of scientists and (non-speculative) poets, Mundane Horror, Nature, Religion, Gender, Real history, Cowboy & Western, and Romance. As mentioned above, the purpose of the “What Is Speculative Poetry” survey was to determine informally whether there is an overall consensus among the membership regarding what genres or sub-genres of poetry belong under the heading “speculative”. Based on the results, the answer to that question is clear as mud–yes, there is consensus, and no, there really isn’t. Are we surprised? Not really! As of the writing of this summary, the SFPA’s implicit policy is that the determination of eligibility of poems (and poetry collections) as speculative is subject to the discretion of our appointed editors and chairs, with oversight by the SFPA executive committee. This policy may change, and/or be made more explicit in our official guidelines, pursuant to ongoing (and future) review. As ever, we encourage discussion and feedback on this and other topics of interest to our community. In the meantime, we want to express our sincere thanks to everyone who participated in this survey—as well as the members of our discussion forums—for your investment in the SFPA and the speculative poetry community.